Blessed Affirmations pendants and necklaces, all originals by designer Deborah Birdoes, are beautiful ways to express your sentiments toward those you love. For example, our Blessed Affirmations "Friends" Necklace #2147 is fashioned with an angel on the front; the message on the pendant back reads, "Friends are angels in disguise." 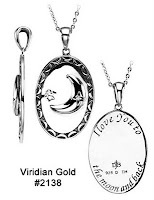 One of our most popular Blessed Affirmations necklace is the Blessed Affirmations "I Love You" Necklace #2138. 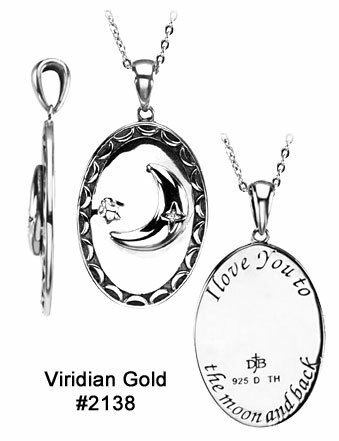 Designed with a moon and a small star on the front, it reads, "I love You to the moon and back" on the back of the pendant. 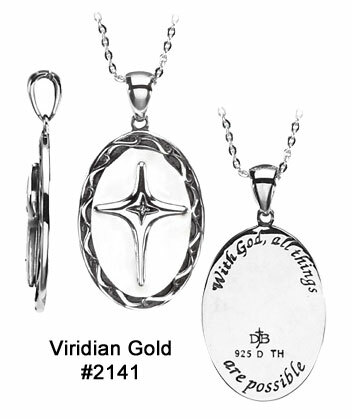 See our Blessed Affirmations "All Things Possible" #2141, a reminder of hope for a loved one or friend who is struggling, or a celebration of answered prayer; or check out our Blessed Affirmations Necklaces for our complete selection. If you still haven't found that special item you are searching for, take a look at our Symbols of Faith and our Marriage, Family and Friends Pendants. All Blessed Affirmations necklaces are .925 sterling silver and are rhodium plated to help prevent tarnishing. Each pendant is adorned with a small diamond and comes with an 18" sterling silver chain. Packaging includes an Inspirational Blessings gift box with a message and two verses of scripture: "For out of the abundance of the heart the mouth speaks" (Matthew 12:25), and "Kind words are like honey - sweet for the soul and healthy for the body" (Proverbs 16:24).